Understand the optimum set-up for cloudy/overcast/diffuse light, and use of mirrors with PV. Phil Turner, who lives on the Isle of Wight (just off the south coast of England) in a densely populated area, wrote to me early October 2007 to tell me of his "preliminary" experiments, and kindly gave me permission to quote him provided that I stress that his findings are very "early stages". Phil has been experimenting with both mirrors and orientation to increase power from some small solar PV panels at home, eg in cloudy weather. The mirrors were angled at about 100 degrees to the panel (I need to do more testing to find the best angle). This experiment was done in full cloud cover, hence the low output for a 6W panel. As you can see there are some gains to be had even when the sky is completely covered in cloud. During sunny conditions, the less that optimal position of the panel shouldn't be a problem as the loss of direct sunlight is made up for with the reflected light. Using two mirrors is an option for me as my tiny garden faces west and so direct sun only occurs at around midday (a panel in a south facing garden would lose direct sunlight if a mirror was placed east facing west). I have ordered two Perspex mirrors from an ebay seller for £7.25 each plus £9 postage in order to do some more extensive testing. I have also purchased a briefcase type 13W PV unit from Maplin for £60, which I will separate into two panels and then test one with mirrors and one without. I can see one problem that I will need to overcome, that being the collection of dirt and debris on the panel surface as it will be facing skywards, this i'm sure will reduce output somewhat. I am also aware that excessive heat causes a reduction in output from PV panels, though I dont think that this will be much of a problem here in the UK. There is quite a lot of literature available on the Net indicating that straight-up is indeed the best direction for a panel in diffuse light. It is probably also beneficial to use a panel type optimised for the wavelengths that make it through cloud best. On the issue of a horizontal panel getting dirty, I suggested that bird droppings can be a significant problem, but as long as you keep the panels tilted about 5--10° to allow for rain runoff and avoid water pooling, other dirt might only require a brief clean every few months. If you had the chance to tilt the panels vaguely south that might help marginally with direct (non-diffuse) sunlight collection. I did do some very brief experiments on one cloudy day that seem to support the straight-up-is-best-when-cloudy view, and I may put money where my mouth is by buying another UniSolar amorphous panel (meant to work well with the light in overcast conditions) and putting it on an area of flat roof when we fix our porch! I have managed to get several hours of data today from my testing with a 13W 'briefcase' style PV panel. The data confirms to me, that using mirrors with a straight-up facing panel is highly beneficial to us here in the UK. 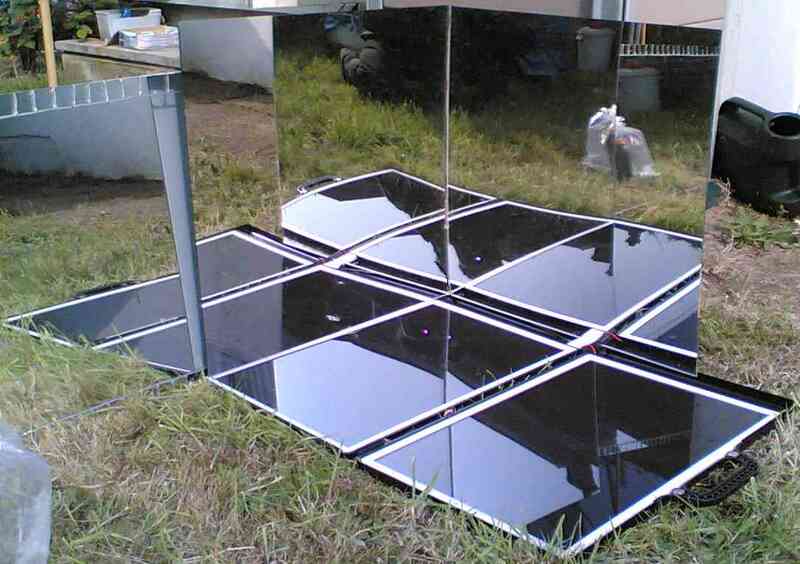 I've attached A jpeg image of my crude mirror setup, plus a spreadsheet file of the amp output of the PV panel. The weather here in the Isle of Wight today has been sunny, but hazy/misty, so not exactly full sun. The data starts out with the panel on the ground without any mirrors, the mirrors being added at measurement 39 (there is no direct sunlight on the panel at this time). At measurement 241 an additional mirror is added (north facing south) which helps to bump up output a little bit. At measurement 1232, I have removed all the mirrors (shadows from my neighbour's house are getting close), and this shows quite a drop in output, at measurement 1245 I aimed the panel directly at the sun which clearly shows a smaller output than when the panel is used with mirrors. Peak output occurred at measurement 817/8, when it achieved in excess of .7amps. This panel is rated at a maximum of 13Watts at 17.5Volts. Having (as of Feb 2009) solar PV installations on west- and east- facing shallow (23°) roof surfaces I can report that in clear skies the strings facing in opposite directions show very different output strongly dependent on the sun angle to them, as you would expect, maybe with power ratios of as much as 100:1. As the sky gets hazy the panels facing away from the sun start to generate distinctly more (up to a few percent of maximum rating), and under light but unbroken cloud generation may drop to (say) 10% of rated peak but with all panels generating essentially equally implying that the incoming radiation hits the panels from all parts of the sky. For example, right now (20090222-0940 GMT under a dull grey sky) the east-facing panels are generating at 7% of maximum and the west-facing panels at 6% even with the sun very clearly well over to the east in the sky. Five minutes later, with the sun finding a slight hole in the cloud, west-facing generation rises slightly to 8% but east-facing to 13%. One upshot is that the precise direction of the panel (at least on a reasonably-shallow roof) is less important in a northern Europe winter than in summer since increased cloud cover ensures much more diffuse light. 2016/06/11: near-horizontal amorphous panels on my shed roof on the east of the house seem to work quite well (and catch some direct sun outside winter). A Fieldlines tracking-in-diffuse-light thread. "I can attest that under 'fair' overcast skies, I was able to double my current by pointing straight up, as opposed to pointing in the direction that the sun 'was'. As long as the clouds still appear brighter than a light grey, there is usable power to be had." First published 2007-10-03 , updated 2019-04-22 . Site copyright © 2007-2019 Damon Hart-Davis. Hosted by ExNet.